You bought ebook on ereader.com, you want to read those ebook on iPad or Kindle, but you can’t do that directly, because those ebook has DRM protection, this is turorial about How to remove DRM from ebook ereader.com. ebook on ereader.com has PDB format, you need download and install PDB DRM removal at here, it has windows and Mac version, PDB DRM Removal is easy to use, it remove PDB drm protection with 1-click without quality loss. 1. 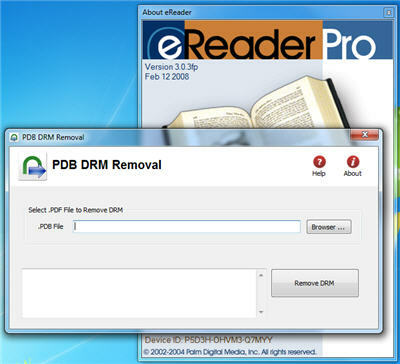 Download and install PDB DRM Removal on ebook-converter.com, you can install it as normal app. 2. Run PDB DRM Removal, select PDB file on Hard drive,PDB ebook normally locate at “PDM” in “My Document”, click “Remove” button. 3. A window popup to input name and credit card number, it is same as you read ebook on eReader app, if anything is correct, DRM protect will be removed, DRM will be removed and produce a new .pmlz file . 4. to read new ebook in iPAD, you convert .pmlz file to Mobi format using Calibre, here is tutorial. .pdb is Palm Media ebook format, read in eReader that is a freeware program for viewing Palm Digital Media electronic books, Versions are available for iPhone, PalmOS, WebOS, Android, Symbian, BlackBerry. ereader.com maintains a wide selection of eReader-formatted e-books, available for purchase and download, with a handful of public domain titles available for free. 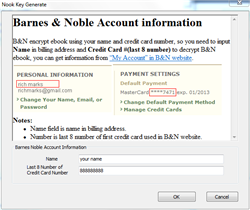 Those books that aren’t free are encrypted, with the key being the purchaser’s full name and credit card number. This information is not preserved in the e-book. A one-way hash is used, so there is no risk of the user’s information being extracted.